Get proactive and get results you can see. users have the tools to continuously improve their cost reduction results. Purchased services spend is driven by non-standard units of consumption, or utilization; therefore, attentive monitoring is required to eliminate vendor over-billing, internal compliance to preferred vendors, and expense misclassification. Get notified when an incorrect GL is used or when an invoice is missing a purchase order. Timely alerts allow for deeper visibility and for immediate action. Get notified if spend spikes higher than expected for a specific category or when an unapproved vendor is utilized. Auto-monitoring unapproved spend keeps your savings initiatives on track. Quickly and easily identify the exact facility and department that triggered the alert and take necessary steps to resolve the root cause of each discrepancy. Track annual goals and monthly progress from a user-friendly dashboard. Easily report on captured savings, preferred vendor conversion progress, and more. Our team is experienced in every aspect of purchased services and offers solutions to support your team’s needs. Whether it’s technical support, bandwidth or project management, we’re flexible enough to assist with any size project that will empower you to reach the savings goals you desire. Utilizing Valify’s proven Purchased Services Assessment (PSA) to identify cost savings opportunities, a mid-sized IDN in the Northeast found that their Regulated Medical Waste spend per staffed bed was above the 75th percentile in Valify’s KPI benchmark spend database, which includes data from 1,100+ hospitals. The client provided Valify with their Regulated Medical Waste contracts to receive a vendor-specific benchmark. Analysis through the Valify category benchmarking process revealed inconsistent pricing from the same vendor across multiple facilities within the system. Valify provided an actionable benchmark for target pricing, seen from the incumbent vendor within the previous twelve months. 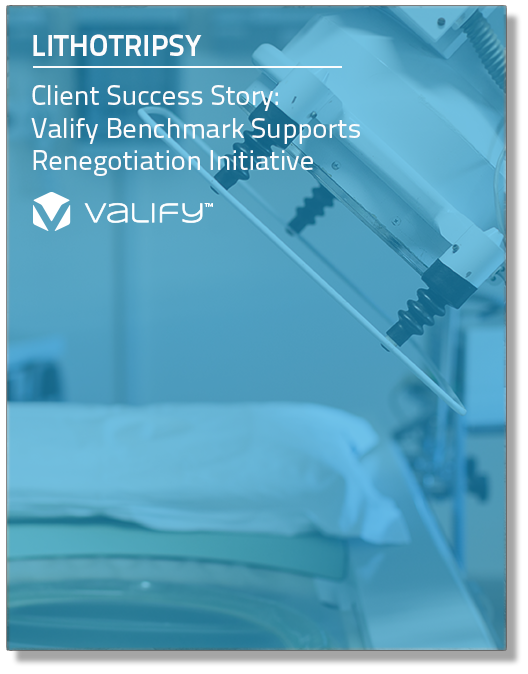 Armed with Valify's benchmark data and analysis, the client successfully renegotiated with the incumbent vendor and reduced costs on Lithotripsy.